It’s been twenty years since Mac Davis wrote those words, but it’s still the best opening line ever for a country and western song. Not being a fan of country music, I never actually listened to the rest of the song. But since it came to mind while I was writing my homily, I checked out the lyrics. Far from being an attack on humility, it’s really a warning about pride. The singer has no girlfriend, because no-one can compete with his charm, and no friends, because he wants to stand out in the crowd. “I’m doing the best I can,” is his last line, and it’s clear his best isn’t very good at all. I was pleased to discover the honesty of the song, because humility is one of the most misunderstood of all virtues. And false humility—seen best in Charles Dickens’s repulsive character Uriah Heep—is one of the most unattractive of vices. Our English word comes from the Latin humus, which means “ground” or “soil.” In classical Latin it was a negative word used to describe unimportant or insignificant things, or persons of lowly birth or weakness of character. In Roman culture, which worshipped power and nobility, the lowly were viewed with contempt. The humble were treated with contempt. The Old Testament took a different view of humility. Those who were lowly in the eyes of the world were special to God, who hears the cry of the poor. Since they had nothing but God, he took special care of them. Psalm 25:9 says that the Lord “leads the humble in what is right” and teaches them his way. Psalm 131 is the beautiful prayer of a humble person, whose heart is not proud, allowing him to trust completely in God. This morning’s first reading is a prophecy that calls Israel to humility and promises its reward. The humble are actually protected from God’s wrath by their virtue. Lowliness is a blessing, because it leads to depending on God alone. The humble utter no lies, because humility is rooted in the truth: in the truth about God, in the truth about each individual, in fact, “in the truth of reality” (The New Dictionary of Catholic Spirituality, 516). Jesus, whose leads us into all truth through the Holy Spirit (cf. John 13), fully develops the Old Testament view. He calls each disciple to be as humble as a little child (Mk 10:15) and to learn from him, for he is meek and humble of heart (Mt 11:29). 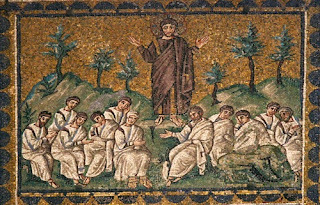 At the Last Supper, he teaches by example, washing the feet of his disciples like a humble servant or slave. The Gospel today is the high point of Jesus’ teaching on humility. He promises the lowly the kingdom of heaven. He offers the meek the whole earth as an inheritance. When his words reached the ears of the Romans, they’d have been mighty confused. It’s not only Latin-speakers who can be thrown by this famous Gospel text. Almost all of us resist some of the individual beatitudes. Most of us are quite happy with “Blessed are those who mourn, for they will be comforted.” We don’t choose to mourn, and we’re big on comfort. Since we’re Canadians, known for our non-militaristic attitudes, we probably welcome the promises made to peacemakers; and who has a problem with being pure in heart? But things gets tougher to swallow when Jesus talks about being meek or merciful. Here we come up against social and psychological values that resist these virtues—or which see them as vices. Certainly being meek is seen as a weakness, and mercy can degenerate into unhealthy enabling of others. To show that his words are meant to challenge and even distress us, Jesus saves the hardest of all eight teachings for last: blessed are the persecuted. Even if we’ve stayed with the sermon all the way through meekness and mercy and the hunger for justice, the Lord seems to go too far when he gets to persecution. There are so many ways to look at this dilemma, but this morning I’m offering only one. Because I think the Sermon on the Mount not only teaches humility—it also demands humility if we’re to really hear it. Hearing these words of Jesus requires a certain attitude. And that attitude says, more or less, that God knows what he’s talking about. That God actually knows some things I don’t. I don’t say that you find it hard to accept that mercy and meekness and persecution are paths to the kingdom of heaven; I find it hard, so I simply assume you do too. But the reason I find it hard to accept these things is that, deep down, I make myself bigger than God. What proof do I have that mercy and meekness and persecution aren’t blessings? None at all—only my human way of thinking, which by definition in this case is opposed to God’s way of thinking, clearly stated in the Gospel we’ve heard today. And what’s the cause of that? A lack of humility, a lack of the humble attitude that puts God in charge and restrains the arrogance and infinity of my appetite to know more than he does. My trusty spiritual dictionary says: “Humility is … grounded in a deep awareness of our limitations and shortcomings in the presence of the divine perfection, and of our sinfulness in the presence of the all-holy God…” (The New Dictionary of Catholic Spirituality, 516). There’s the key to understanding and accepting the beatitudes: humility, which leads us to recognize that God’s perfect and I’m not. That only he, the Creator, sees the world exactly as it is, and me exactly as I am. The same dictionary says that humility means grasping the truth about ourselves and about God. If today we accept what Jesus taught his disciples in the Sermon on the Mount, despite our human doubts and hesitations, we’re becoming more humble; because we’re slowly seeing things through the eyes of God rather than our own. Because there’s only One who is perfect in every way, and it’s not Mac Davis.